Poole passenger and car ferry ticket prices, timetables, ticket reservations and information for ferries sailing from Poole to Cherbourg, Guernsey, Jersey and St Malo. Compare all available Poole ferry ticket prices in real time and book the cheapest available Poole car and passenger ferry tickets sailing to and from Poole, Cherbourg, Guernsey, Jersey and St Malo with Brittany Ferries or Condor Ferry Lines ferries online with instant confirmation. Book Poole Ferry Tickets with Brittany Ferries or Condor Ferry Lines for ferries sailing from Poole to Cherbourg, Guernsey, Jersey and St Malo online in advance to enjoy the cheapest available ferry ticket price. The price you see is the price you pay. There are no hidden extras or surprises such as added fuel surcharges or booking fees and we do not charge you anything extra for paying with a Visa Electron card. The price we quote you for your selected Poole passenger or car ferry ticket, onboard accommodation and vehicle type is all you will pay, and that's a promise. To obtain a Poole ferry ticket price and book your ferry ticket securely online please use the real time ferry booking form on the left. You are also able to add a hotel at your destination, or anywhere else, to your ferry ticket when completing your ferry ticket reservation. 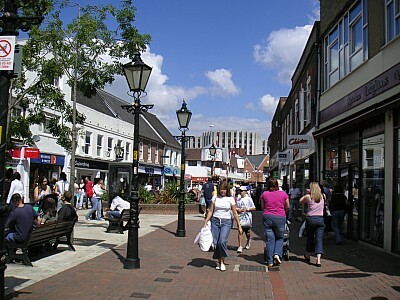 Poole is a rapidly expanding town with a population approaching 140,000. Poole came of age in 1248, the year it was granted self government by the signing of the Longespee Charter by William Longespee II, the then Lord of the Manor and the great grandson of the towns founder. The historic heart of Poole is centred around its most famous feature, Poole Quay, which has played a key role in the development of the town through the years. Poole has been a trading port since the Tudor times, bringing both employment and prosperity to the town. During the Second World War, Poole played a significant role, being one of the largest embarkation points for the D-Day landings and even now the port continues to play host to the Royal Marines. Today the port continues to provide employment, with regular freight and passenger services to France and the Channel Islands. Poole is home to a small but successful fishing fleet, with catches being landed on the Quay. As you stand facing the water, walk along the quay to the left, where you will find the fishermans marina and the landing area for their catches, as well as the old RNLI Lifeboat station, which is now a small museum. Poole Harbour is the largest natural harbour in Europe and is the home to the many yachts, pleasure craft and working craft, such as Diving Operators which operate alongside the wildlife that can be found in the water and along the shores and coastline. If you take a walk along Poole Quay you will see great changes taking place, with the development of new buildings and the expansion of existing businesses. BROWNSEA ISLAND - National Trust Island in Poole Harbour. CENTRAL PARK - Gus Gorilla's Jungle Playground & Ice Skating rink. COMPTON ACRES - World famous gardens in Poole. DOLPHIN SHOPPING CENTRE - Pooles premier shopping location. DOLPHIN SWIMMING POOL - Swimming Pool & health/fitness suite & solarium. EATING OUT - A directory of restaurants in Poole. EILEEN SOPER'S ILLUSTRATED WORLD - Bringing alive such favourites as The Famous Five, The Secret Seven, Alice in Wonderland and many more. LIGHTHOUSE - Poole's Centre for the Arts, (formerly known as Poole Arts Centre). LOCAL HISTORY CENTRE - Resource centre for local history. MOTORBIKE EVENINGS - Check out the bikes on Poole Quay. ON THE BEACH - Summer Beach Parties with Fireworks ! POOLE CYCLE SPEEDWAY - Cycle Speedway .... it's great fun ! POOLE GREYHOUNDS - A night at the dogs ! POOLE MUSEUM & SCAPLENS COURT - Pooles' local Museums. POOLE PARK - The park the locals and visitors love ! POOLE POTTERY - Now under new management. SANDBANKS FERRY - The famous chain ferry. SPLASHDOWN - The South's best waterslides ! SPECIAL SUMMER EVENTS - Pooles' popular free programme of summer events. TOWER PARK - Poole's premier entertainment spot. EMPIRE CINEMA AT TOWER PARK - Pooles' 10 screen multiplex cinema. UPTON COUNTRY PARK - 100 acre parkland for the family to explore. WATERSPORTS - Don't watch, get involved! Best Price Guarantee - We always offer you our lowest available DFDS Seaways, Stena Line or P&O passenger and car ferries ticket price to and from Poole. There are no hidden extras or surprises such as added fuel surcharges or booking fees and we also we do not charge you anything extra for paying with a Visa Electron card. The price we quote for your selected Poole ferry ticket, onboard accommodation and vehicle type is all you will pay, and that's a promise! In the unlikely event you find the same all inclusive Poole ferry ticket cheaper in the brochure of any other tour operator we promise that we will do our best to beat that price or offer you the choice of requesting a refund. To book Poole car and passenger ferry tickets please click here. At FerryTO you are able to obtain live Poole ferry ticket prices, check availability and book car and passenger ferry tickets to and from Poole at our lowest available ticket price. Ferryto.co.uk is part of the world's largest online ferry ticket distribution network providing the ability to book over 80 major European ferry operators including to Poole and to over 1,200 other ferry routes throughout the UK, France, Spain, Ireland, Holland, Eastern Europe, the Mediterranean, the Baltic and North Africa.